Many businesses are realising the benefits of going green, and more consumers are taking an interest in the ethical and environmental policies of the brands they buy on a regular basis. Going green is now more than a trend, as complying with CSR and government regulations is a priority for many small and large businesses. A printing company serving companies all over the UK is urging organisations to go even greener this season, to promote business sustainability in the exhibition sector. With waste disposal becoming an issue for many businesses, it becomes incredibly expensive when exhibiting at a trade show or event. The environmental impacts of these huge amounts of waste collected from events should also be considered – especially when most of it can be recycled or re-used, but is left behind as trash. Printdesigns is an industry leader in economical and sustainable exhibition displays. The bamboo banner stand is attractive and eco-friendly, and offers a sustainable alternative to display stands made from materials such as aluminium, steel and plastic. 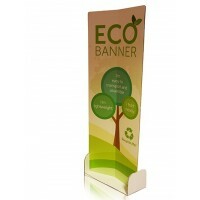 The company also offers its Eco Banner Stand which is 100% completely recyclable, made from Ultra Board cardboard. If a business is looking for longevity and attends multiple exhibitions per year, they should look no further than the TEXstyle range of fabric displays. With graphics printed directly onto fabric, this makes the stand extremely portable and ultra-lightweight, and it’s a much more environmentally conscious option. The graphics panel itself can be folded away and stored safely so it can last longer, and can also be washed along with other fabrics in a washing machine. At the end of its life it can be recycled. « Do Promotional Items Still Work?